UDM Downloads > PST Contacts Exporter! Export Outlook Contacts to OE, VCF and MS Excel format with a very unique technology of PST Contacts Exporter. You may be face difficulty to manage huge amount of Outlook Contacts in a single PST file which is a big reason of file corruption and want to convert them in some other software. PST Contacts Exporter keeps an advance technology to convert ANSI format (MS Outlook 2000/2002/ XP) and Unicode format (2003/2007) to WAB, MS Excel and VCF. Easily Export PST Contacts Information such as names, address, phone numbers, email id etc without losing data with matchless quality of PST Contacts Exporter software. Software provides an attractive and simple user friendly interface that's why no needed to require any type of technical skill to use this software. Export Outlook Address Book is very simple in use and secure to manage unlimited Outlook Address Book information. It supports both configured and orphan PST file to Export Outlook Contacts. 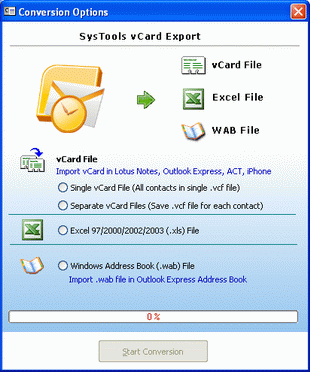 While using vCard Export to convert MS Outlook Contacts in VCF, MS Excel, WAB file format, you must have to install MS Outlook 97 and above ((98/2000/2002/2003/2007/2010). Software supports all versions of MS Outlook and runs successfully with all versions of windows such as WIN 98/2000/2002/2003/2007/vista etc. SysTools Software has great demand in world wide market to its simplicity and secure ness. Once try vCard Export and take full utility of this software to Export PST Contacts Information to OE. Demo version also available to convert 15 Outlook contacts in some other software at free of cost. To take any other help regarding Export Outlook Address Book contact to our support team at 24*7. Software provides two type of license version to purchase, Personal license and business license. To Export PST Contacts Information try Personal license at $49 and other for $99.